"I've never been a big fan of beets, but in certain things, like borscht, I love them. With that simple soup as an inspiration, I thought the flavors would work nicely with the rich, fatty short ribs, and they sure did." Generously season short ribs with kosher salt and freshly ground black pepper. Heat vegetable oil over high heat in a heavy pot. Brown short ribs on all sides until they are dark brown, about 6 minutes; transfer to a bowl. Add onions and continue cooking over high heat until onions go from golden to dark brown, about 8 minutes; this will make a richer, darker sauce. Stir flour into the onion mixture; cook for about 1 minute. Pour in broth; add bay leaf, beets, carrots, and celery. Bring pot to a simmer. Place browned short ribs in pot, evenly distributing them among the vegetables. Bake in preheated oven until meat is tender, about 2 hours. Transfer meat and vegetables to a serving platter. Bring sauce to a fast simmer over high heat until it is reduced by half and slightly thickened, 5 to 10 minutes. Taste for seasoning and add more salt, if needed. Serve in bowls topped with a dollop of sour cream and chopped fresh chives. 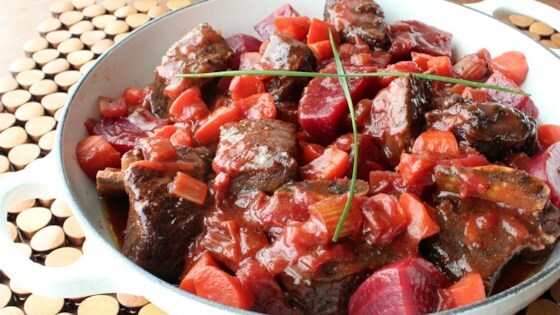 Enjoy tender beef short ribs with beets, carrots, and onion. I used 2 large beets totaling 1 pound, peeled and cut into eighths. Optional step: when you taste your finished sauce, if you want to add some acidity to balance the sweetness, adjust with a splash of white vinegar. O.M.G!!!! I hate beets. Now, I love them! Fantastic! Made no changes just really, generously, seasoned my ribs with salt. Perfection!